Microscopes magnify the tiniest inhabitants of this world. From the minute details of cells to the delicate cilia of paramecium to the intricate workings of Daphnia, microscopes reveal many miniscule secrets. Calculating total magnification uses simple observation and basic multiplication. Microscopes use lenses to magnify objects. 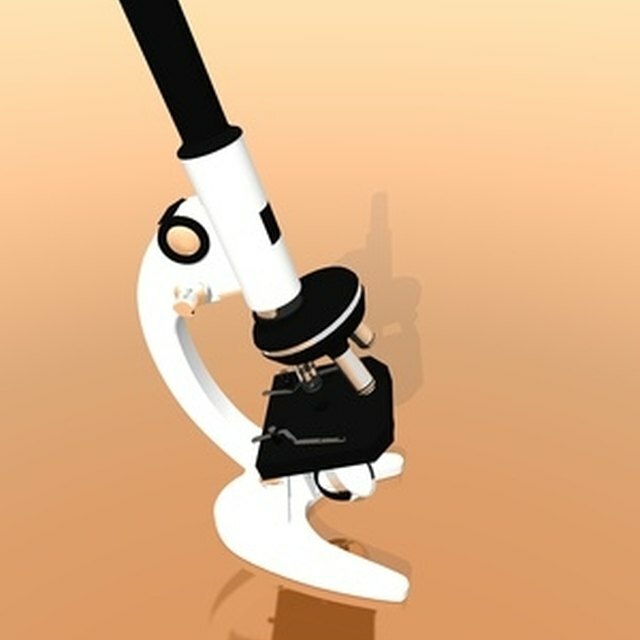 A simple microscope uses only one lens; a magnifying glass could be called a simple microscope. The magnification of a simple microscope doesn't need any calculation because the single lens is usually labeled. A hand-lens, for example, might be labeled with 10x, meaning the lens magnifies the object to look ten times larger than the actual size. Compound microscopes use two or more lenses to magnify the specimen. The standard school microscope combines two lenses, the ocular and one objective lens, to magnify the object. The ocular or eyepiece is found at the top of the body tube. The objective lens points down toward the object to be magnified. Most microscopes have three or four objective lenses mounted on a rotating nosepiece. Rotating the nosepiece lets the viewer change the magnification. Different objective lenses provide different magnification options. Finding the magnification of each lens requires examining the casing of each lens. On the side of the casing is a series of numbers that includes a number followed by x, as 10x. This 10x shows that the lens magnifies an object to appear ten times larger than reality. Depending on the manufacturer, this magnification number may appear at the beginning or at the end of the number sequence. To calculate total magnification, find the magnification of both the eyepiece and the objective lenses. The common ocular magnifies ten times, marked as 10x. The standard objective lenses magnify 4x, 10x and 40x. If the microscope has a fourth objective lens, the magnification will most likely be 100x. Once the magnification of each individual lens is known, calculating total magnification is simple math. Multiply the magnification of the lenses together. For example, if the eyepiece magnification is 10x and the objective lens in use has a magnification of 4x, the total magnification is 10 × 4 = 40. The total magnification of 40 means that the object appears forty times larger than the actual object. If the viewer changes to the 10x objective lens, the total magnification will be the ocular's 10x magnification multiplied by the new objective lens's 10x magnification, calculated as 10 × 10, for a total magnification of 100x. Calculating magnification in telescopes uses a different equation than calculating magnifiction in microscopes. For telescopes, one magnification calculation uses the focal lengths of the telescope and the eyepiece. That calculation is: magnification = focal length of telescope ÷ focal length of eyepiece. Like the microscope, these numbers usually can be found on the telescope. G, Karen. "How to Calculate Total Magnification." Sciencing, https://sciencing.com/calculate-total-magnification-5062733.html. 30 April 2018.